Palestinian Authority (PA) Chairman Mahmoud Abbas accused Israel on Friday of a “genocidal crime” in Gaza, telling the United Nations negotiations had failed and the time for Palestinian independence had come, and drawing a sharp rebuke from Washington, AFP reports. Abbas vowed to seek war crimes prosecutions against Israel over what he called the 50-day “war of genocide” in Gaza that allegedly killed 2,140 Palestinian Arabs – at least half of whom were projected to be terrorists, according to expert analysis. Speaking to the 193-nation Assembly, Abbas asserted that it would be “impossible to return to the cycle of negotiations that failed to deal with the substance of the matter and the fundamental question” of statehood. He accused Israel of continuing to build up Judea and Samaria and maintaining its defensive restrictions on exports and imports in Gaza, which he claimed were an obstacle to peace. Speaking at the UN General Assembly in New York, Abbas played with pathos. He did not set a deadline for fast-tracking to what he claimed would be “Palestinian statehood,” after aides suggested they were eyeing 2017 as a possible date. 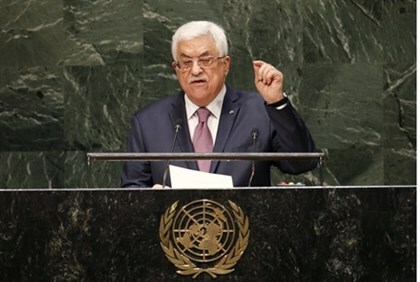 The Palestinians have threatened to join the Hague-based International Criminal Court to allow legal action to be taken against Israel, but Abbas did not specify in his address whether he would resort to the ICC. In 2012, the Palestinians won the status of observer state in the United Nations, which gives them the ability to become a party to the ICC, where they could sue Israeli officials over alleged war crimes – but would also be subject to their own persecution over its gross violations of human rights. Hamas’s leaders-in-exile have facilitated, over and over again, the use of Gaza’s civilians as human shields during the fifty-day long conflict, and then padded the “civilian” death count to include known terrorists killed in targeted airstrikes. The US State Department reacted with a tersely worded statement, calling the speech provocative and saying it would undermine peace efforts. “President Abbas’ speech today included offensive characterizations that were deeply disappointing and which we reject,” said spokeswoman Jen Psaki. “Such provocative statements are counterproductive and undermine efforts to create a positive atmosphere and restore trust between the parties,” she said. Abbas said a resolution backed by Arab countries would be presented to the UN Security Council to relaunch talks with a view to reaching a final settlement with Israel on the two-state solution. The council has been trying for weeks to unite behind a draft resolution seeking to shore up a ceasefire accord in Gaza.